Today I have a card for the current Runway Inspired Challenge which features this fabulous outfit. I just love how the colourful flowers contrast against the bold design of the black and white. I went for a graphic look and created my background by using painter's tape and masking off a chevron pattern and inking it up with Black Soot Distress Ink. 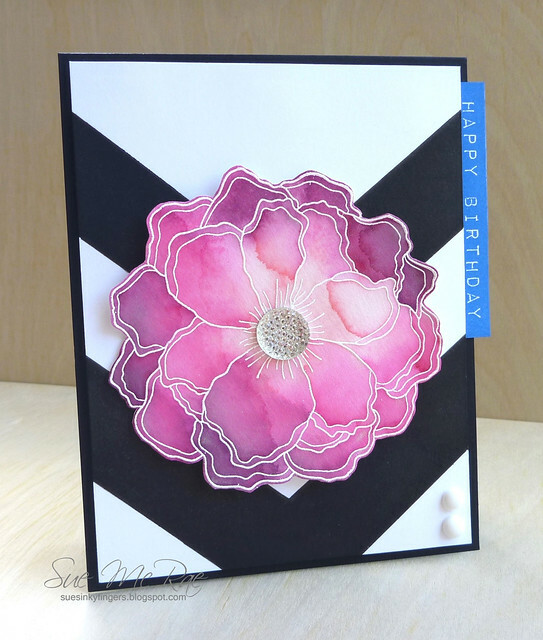 The Stencil Flower from Hero Arts was white embossed onto watercolour paper and coloured with Distress Inks in Worn Lipstick, Picked Raspberry and Seedless Preserves. To get the inks to blend I sprayed them heavily with water and one quick spray of Perfect Pearls. I finished off with a sentiment from Altenew and a few embellishments. Wow fabulous card, Sue! 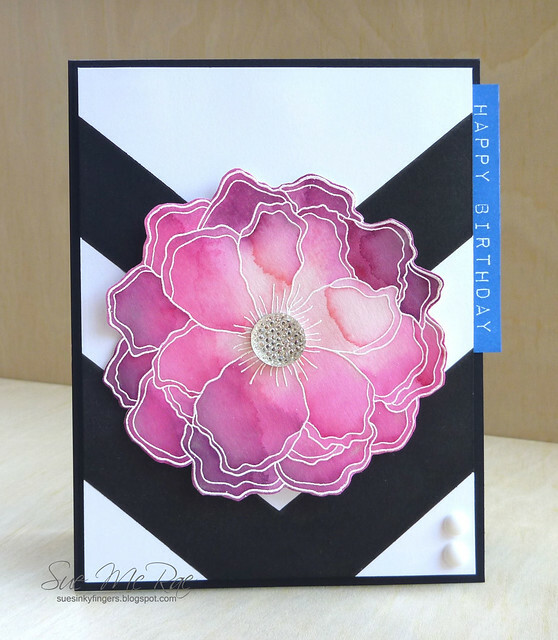 Your watercolour flower is so pretty and I love the background you created by masking and applying distress ink! Well done, Sue! Those challenges always intimidate me, but you rose right to the challenge! Love your interpretation of it, especially your blue sentiment mimicing her bag! This flower is absolutely gorgeous. The black bold stripes remind me of a runway, but I do see how the dress was influential - my first thought was a runway and it all comes together so well! Beautiful card Sue, love the total effect. This is a wow take take on the inspiration photo! Love it! Love this card, Sue! That flower just pops right off the chevron pattern. Great take on this challenge. This is one stunning card, Sue... also my favorite. I think I see a winner here. Can't stop staring at it... fabulous!!! Wow, this is incredible! Gorgeous in every way- from the black and white chevrons to the saturated colors in the flower, to the sentiment! Thanks so much for joining us on the Runway! Oh, my, goodness! This so gorgeous, I cannot believe how delicate it looks. Did not know you could get that effect on WC paper. Love it, Sue. Wow, wow, wow & wow. I love this! That little blue accessory of a sentiment--perfect touch.